In May 1854 an illiterate refugee named John Brown swore a declaration before a London lawyer “relating to the seizure, enslavement, and torturing of John Glasgow, a free-born British subject … in order that any person disposed, to make inquiries respecting John Glasgow’s English wife and family, may have legal evidence on which to proceed.” Behind this move was Louis Chamerovzow, secretary of the British and Foreign Anti-Slavery Society whose Anti-Slavery Reporter of July 1853 had told Brown’s story. That is where London’s Daily News of 13 August 1853 obtained the story of John Glasgow. Brown should not be confused with white radical abolitionist John Brown whose raid on Harpers Ferry in 1859 had a different significance. John Brown, born into slavery in Virginia around 1818, worked in the cotton fields of Georgia near Milledgeville before being sold on to planters in other states. At Milledgeville Brown met John Glasgow, a sailor from British Guiana (today: Guyana) whose stories of life in England encouraged Brown to consider escaping slavery and venturing to England. Glasgow had married a Lancashire woman and had two children and a small farm when he sailed to Savannah, Georgia’s main cotton port, in 1829. Slave states in the U.S.A. had strict controls on their black residents, and those with ports (Louisiana, Alabama, Georgia, and the Carolinas) viewed the free black sailors on French and British ships with alarum. Several put the black sailors into prison, releasing them when their ship was ready to depart and the captain had paid any debts and fines. Glasgow’s ship was long-delayed, and he was left in prison by the captain. Glasgow was sold at auction for $350, to a planter near Milledgeville. There he met John Brown, who was to say “One of my chief regrets is that I cannot remember the name of the place where John’s wife lived”. Inspired by Glasgow, Brown eventually escaped north to Michigan and then Canada. He was living at 26 Stonecutter Street off Farringdon Street in central London when he made his declaration, having reached England in 1850, having last heard of Glasgow in 1840. 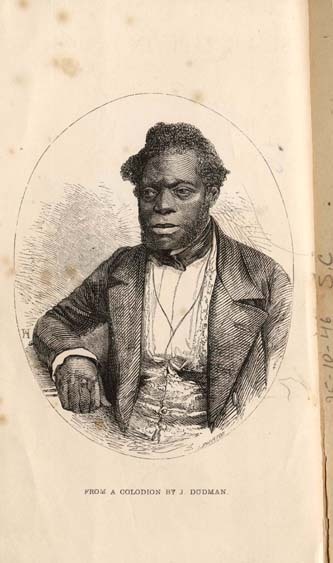 In England Brown worked as a carpenter, gave talks on his experience of slavery, and sought funding to go to Natal, South Africa where he thought his knowledge of growing cotton could be useful. His Slave Life narrative includes quotes from supporters. This can be read on-line at docsouth.unc.edu/nch/jbrown. The New Georgia Encyclopedia states “he earned a modest living as a herb doctor”, married “a local woman” and died in London in 1876. Dorchester was where a John Brown gave a talk at the Corn Exchange on 4 May 1868 when he was billed as the ‘American Botanist’. The Western Gazette gave half a column to its report (Western Gazette, 8 May 1868, p 7). This must be the same individual who worked as a herbalist in Taunton where back in mid-1865 he claimed an unpaid bill, being careful to describe this as for herbs and not medicines (Western Gazette, 23 June 1865, p 5). Brown had been in Taunton in March 1865 (Dorset County Chronicle, 23 March 1865, p 8). This must be the refugee from Georgia. His advertisements in the Sherborne Mercury on 30 October 1866, and both 22 January and 29 January 1867 stressed he was a black man, the ‘celebrated American herbalist’ offering pills and tinctures for the stomach, liver, coughs and the eyes. He was based in Durngate Street, Dorchester. John Lewis was another herbalist noted in Cirencester on 1 June 1883 (Bristol Mercury, 6 June 1883. Another black herbalist was Frederick Dennison ‘who professes to cure all diseases incidental to humanity’ and was fined for stealing an umbrella in Rhyl, North Wales in the summer of 1889 (North Wales Chronicle (Bangor), 24 August 1889). John Glasgow and his family remain untraced. See pages 106, 107 and 118 of this site for information on fugitive slaves in Britain. TO LEAVE A MESSAGE CLICK ON ANY ILLUSTRATION ON OTHER PAGES.